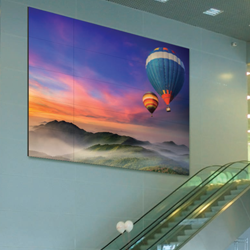 Create visually stunning video walls that are easily installed, maintained and managed when you choose commercial display products from LG. Enjoy flexible content editing in various layouts, including regular matrix and non-formal irregular, without an expensive video wall console. customer’s awareness, particularly in areas with heavy foot traffic such as museums, galleries, and large retail stores.